Bring the power of the most trusted source for financial information to your iPhone, along with tools to help you analyze the world’s markets. More than 300,000 professionals around the world trust Bloomberg to give accurate, timely information about the world’s financial markets. That source is now available to you on your iPhone or iPod Touch. Bloomberg offers news, stock quotes, company descriptions, market leaders/laggers, price charts, market trends analysis, and more. You are also able to create a customized list of stocks that you want to follow from markets around the world. 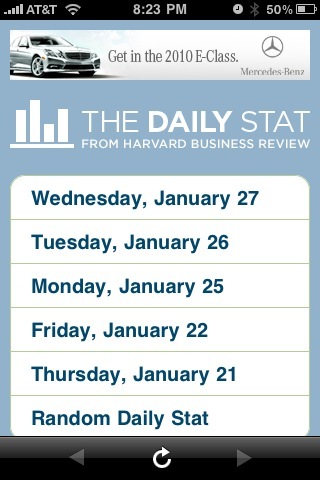 The Daily Stat from Harvard Business Review brings you facts and figures offering a quick, sometimes quirky perspective on our world and the business that happens in it. New statistics are delivered to the app five days per week. 3. 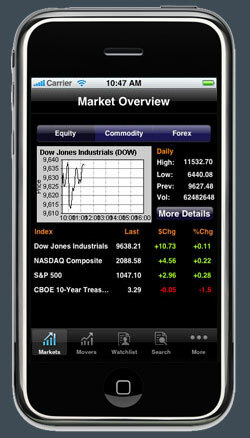 MarketLive by Envision Mobile Ltd.
MarketLive delivers easy to use mobile trading capabilities on todays mobile phones. It supports, out of the box direct data feed while allowing a brokerage to deliver customized market data and trading capabilities. MarketLive enables Financial Institutions and Brokerage to provide investment and portfolio management, with trading capabilties, anytime anywhere to investors. Our solution allows these companies to gain competitive edge, increase customer satisfaction and generate more revenue. 4. DailyFinance – Stock Quotes and Business News By AOL, Inc.
Real-time stock quotes from BATS Exchange and 15-minute delayed quotes from NYSE, NASDAQ and AMEX. Customize and track top business, company and sector news and dozens of other news topics from over 3,000 sources. Stay connected to the stock market wherever you are with FOX Business for iPhone. 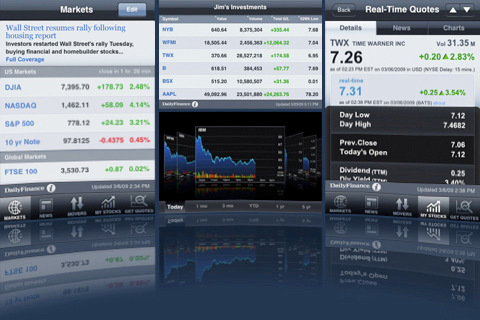 Create your own portfolio to track your stocks and set alerts or watch FOXBusiness.com Live directly from your iPhone. 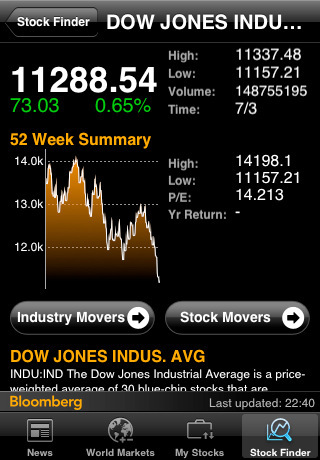 The FOX Business iPhone application offers the day’s latest financial news and market updates. 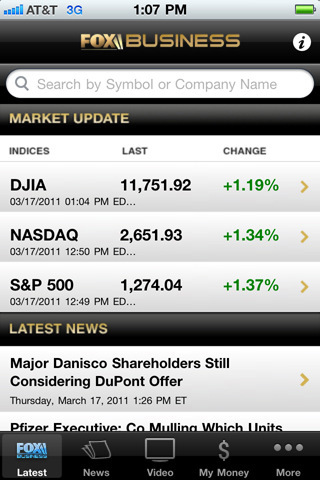 FOX Business for iPhone makes it easy to keep up with the markets, while you’re on the go. 6. Yahoo! Finance By Yahoo! The Yahoo! 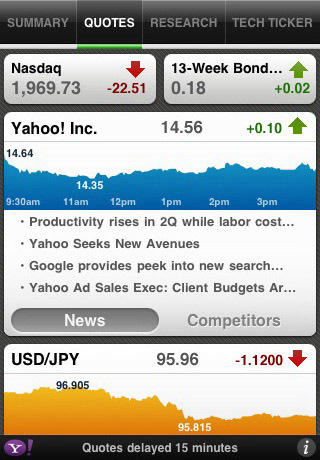 Finance App for the iPhone and iPod Touch brings you total coverage from your favorite financial source. You’ve come to expect the highest quality financial coverage from Yahoo! Finance. Now you can get it all in an app built for you. Ranging from broad market indices to the details on a specific commodity, it’s all here. This app has something for everyone, no matter what your need of financial detail may be. Posted in iPhone Tagged AOL,Bloomberg LP,Envision Mobile Ltd,FOX News Digital,Harvard Business Review,Yahoo!